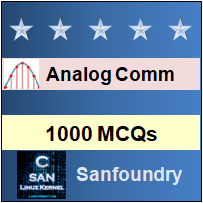 This set of Analog Communications Multiple Choice Questions & Answers focuses on “Instantaneous Frequency and Frequency Modulation”. 1. What we use for impedance matching in RF amplifiers? Explanation: Impedance matching is the input impedance of an electrical load or the output impedance of corresponding electrical signal source to maximize power transfer or minimize signal reflection from the load. Transformer coupling is basically used for impedance matching in RF amplifiers. It is usually used with a small load for power amplification. 2. Neutralization cancels unwanted feedback by bypassing the feedback to the neutral or ground plane. Explanation: Neutralization cancels unwanted feedback by adding feedback out of phase with the unwanted feedback. It is a method of filtering noise out of signals. Explanation: Distortion in a receiver can occur in either mixer or in the detector. It can also occur in IF amplifiers. Distortion is the change in the shape of the waveform. 4. How we limit the response of a receiver to a weak signal? Explanation: The response of a receiver to weak signals is limited by the noise. This noise is generated in the receiver only. Noise is the unwanted signal that is present in the passband of the signal. 5. When aliasing will take place? Explanation: Aliasing causes different signals to become indistinguishable when sampled. It happens when the sampling rate is less than Nyquist rate. To prevent aliasing, sampling signals should be at a rate which is twice of Nyquist Rate. 6. A resonant circuit is a simple form of bandpass filter. Explanation: The quality factor Q, of a resonant circuit is a measure of quality of resonant circuit, thus indicating the performance of the resonant circuit. Bandwidth can be seen as the ratio of the resonant frequency to quality factor. A higher value for Q means a more narrow bandwidth, which we want in many application. 7. Which statement is true for high level amplitude modulation? Explanation: In high level AM, modulation is done at high power of carrier and modulating signal therefore output power is high. Therefore, power amplifiers are not used to boost the carrier and modulating signal. Thus, all RF amplifiers are non-linear. 8. Which statement is true for low level amplitude modulation? Explanation: For low level AM, modulation is done at low power of carrier and modulating signal, so power amplifiers are used to boost the carrier and modulating signal. Therefore, output power is low. Thus, the amplifiers used are linear. 9. Which two networks can be used for impedance matching? Explanation: If a source with low impedance is connected with a load with high impedance then the power that can pass through the connection is limited by higher impedance. Generally the two networks, pi and T are used for impedance matching. 10. Which statement is true about frequency multipliers? Explanation: Frequency multiplier multiplies the frequency of the input by an integer, such that the output is a multiple of the input. Frequency multipliers are generally class C amplifiers.